Former White House chief strategist Steve Bannon visited Hong Kong and praised China’s president. Stephen K. Bannon, U.S President Donald Trump’s former chief political strategist, is famous for his general hard line on China. Days before he left his post in August, he made sensational remarks including stating that the United States is “at economic war with China.” Surprisingly, he seems to have changed tone during his recent trip to Hong Kong. 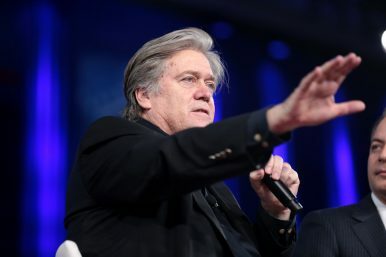 On September 12, Bannon made his first big post-White house speech on “American economic nationalism and the populist revolt and Asia” at an investor conference in a luxury Hong Kong hotel. Although the conference organizer CLSA — a unit of Citic Securities, China’s largest state-owned brokerage — refused to disclose whether it had paid Bannon for his appearance, it’s widely assumed that such event-organizers would pay a large speaking fee to such a high-profile former foreign official. For example, former U.S. President Bill Clinton made $550,000 for one speech to a business forum in Shanghai, China in 2011. CLSA initially said Bannon’s speech would be open to some print media, but decided to close the session a day later. Despite that, multiple people who listened to the speech revealed what Bannon said. Xi is very impressive. He really understands what’s in the best interests of his people. He is very smart, very tough but fair. He is direct and to the point – just like President Trump. That is why they like each other so much. Why Will China Be Happy to See Steve Bannon Leave the White House? Beijing didn't like Bannon's tough talk on China trade, which came out prominently in a recent interview.